I've been feeling rather uninspired at work these past months; actually the downturn in the economy as trickled down to the company I work for and I'm downright scared. So, to help relax my anxiety and fertilize my creative garden, I endeavored to create Christmas gifts this year. Here are a few items that miraculously got finished and Santa helped deliver under trees. 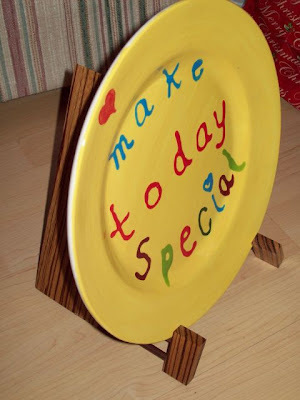 The plate is one that Lady Suzanne made for our girls. Those of you familiar with the movie A Christmas Story might recognize this packaging. I built the crate -- complete with a Western Union Cable tag. Sir Hook then helped me by calling Christmas morning and playing the role of a Western Union Delivery dispatcher who told Lady Suzanne that a package had been delivered earlier that morning in the dark and left near the front door (which I had placed earlier). 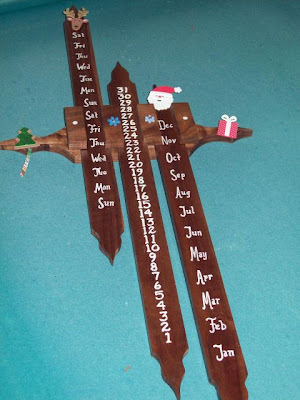 Inside is a perpetual calendar roughly based on one we had seen in a German beer hall here in town (designed to be decorated for the season). I hope you all enjoy playing with your new toys. 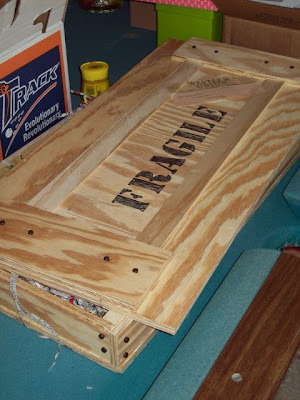 Phone ringing on Christmas morning is usually my brother if he's not coming into town for Christmas...this year it was a great hoax...though the more I thought afer I opened the Fragile crate...sounded like Hook...hmmmm...a great gift all the way around! I love pulling into the driveway from work and seeing David in the Manshop with a pipe in his mouth, football on the little t.v. and sanding or gluing or cutting away on a wood project...jobs may come and go, but certain loves continue...finding a hobby or two is a great way to balance out the "have-to parts" of our lives. 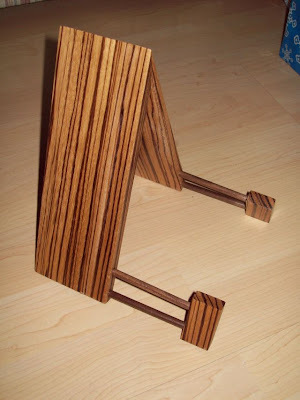 Yeah it is Nine Man Morris ...i accidently named it after the 24 positions. PS. don't worry about work... no matter what happens..Good generous people like yourself always survive and make it through. Next up...Table Skittles! Come on Sir Bowie...keep climbing that mountain! LOL! The 9 Man Morris holds a place of honor at the Hook Castle! Now, I must get busy and finish editing those videos from England!